I’m very fascinated with CNC operated machines, and in the future want to build a CNC router for large projects, but I have neither the space or the money to devote to it at the moment. 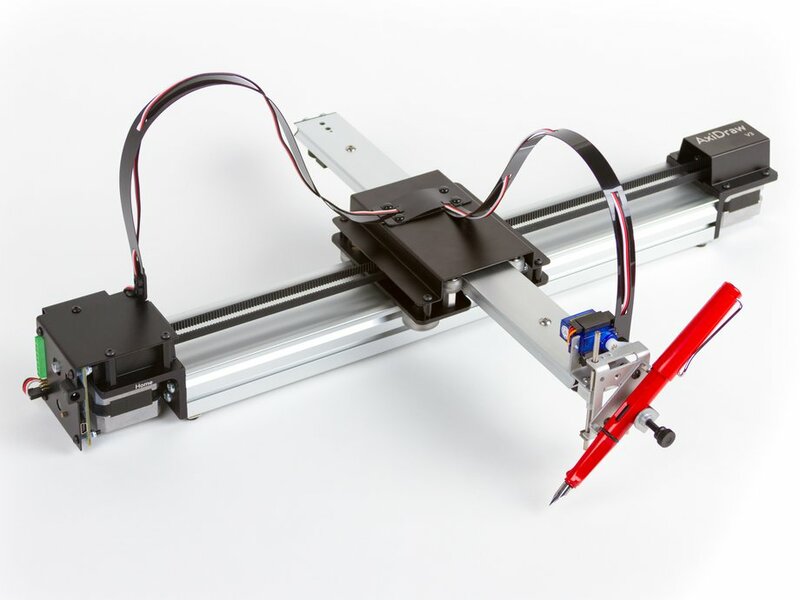 I’ve been wanting a project which I can learn the steps to building a CNC machine, and have thought of creating a small 2D plotter. The idea for my build was sparked from the Cartesio by Robottini who was inspired by the AxiDraw by Evil Mad Scientist. The Cartesio was created in response to AxiDraw’s product price – $450. Robottini claims the Cartesio can be built for roughly $60, but the links he offers for where to find the hardware quickly exceeds this amount. After doing some searching, I found the majority of the main components for just under $100, not including the 3D printed parts. Robottini’s page lists his thingiverse page which one can download all the .stl files to 3D print the parts required for this build. However, I don’t wish to be tied to any creative commons licences, and a majority of the models are boxy shapes that I would like to manipulate anyway. Also, .stl files are a real pain to work with, as the 3D models are made up of polygons (trangular flat surfaces) rather than smooth, consistent surfaces. The images on his website are also difficult to follow, as there seems to be two different designs in the photos. I’ll use this blog to document my hardware and software, steps and design, hopefully in such a way that you could also build your own.